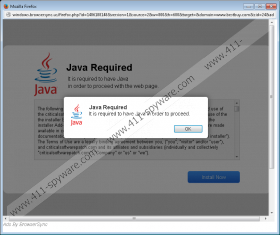 Even though BrowserSync is supposed to highlight and underline keywords which you are supposed to be interested in, our malware researchers have discovered that the program can display Ads by BrowserSync banners, random pop-ups representing fake Java updates, and other suspicious offers. 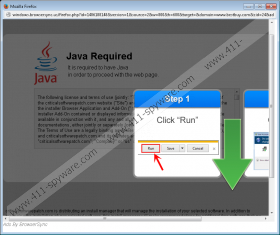 To remove these you need to delete adware running on the PC, which means that you need to remove BrowserSync. It is unfortunate but instead of getting these flooding ads removed, computer users often choose to ignore them, even when they know that these may be presented by unreliable parties. Even though BrowserSync does not seem to collect private information, it is clear that this application may open up certain virtual security backdoors. For example, if you launch the installer of a fictitious update, you may be introduced to a setup promoting a number of third-party applications. Bundled installers are not always trustworthy, which is why accepting random, unfamiliar programs, even if they are free and are presented in an alluring manner, is not recommended. If you are not careful, you may be burdened with the removal of much more clandestine and dangerous infections. If you suspect that BrowserSync removal is not the only task waiting for you, you should be very cautious. The instructions provided below will help you remove BrowserSync and other undesirable computer applications. Unfortunately, it is impossible to know what other threats are running on the operating system and whether their removal is simple as well. In case manual removal is your preference, we suggest using the free SpyHunter’s scanner to discover malware leftovers. Of course, automatic malware removal software can delete BrowserSync and ensure the removal of other infections best. Moreover, the installation of this software can guarantee a secure shield against other threats. In the appeared list select the undesirable program and choose Remove. Click the Windows button on the left of the Task Bar and select Control Panel. Go to Uninstall a program and right-click the program (BrowserSync) you want to remove. Click Uninstall and then continue with the removal of other undesirable software. Right-click on the Metro UI menu screen and select All apps (Apps menu). Open the Control Panel to access more utilities and click Uninstall a program. Find the program you want to remove from the PC, right-click it and select Uninstall.